In New England, the media is discussing the possibility of pitcher Josh Beckett being injured. He hasn’t been below a 3.65 ERA all season. He had a string of bad outings in May, then another string recently. His last start, which was Sunday, saw him give up eight runs to the Blue Jays in just over two innings. Here in Philadelphia we have a somewhat similar situation. On May 9 Chase Utley walked into San Francisco with a .345 average. He was indisputably the top offensive player in the National League. When that three-game series closed, he had a .327 average. A week later he had a .306 average. He up-ticked again, but quickly fell back. By June 24 Utley was hitting .289. Since, Utley has flirted with .295, but is now at a season-low .281 on August 20. Just as Beckett is not a 4.50 ERA pitcher on August 20, Utley is not a .280 hitter on August 20. So as the Boston media questions Beckett’s health, we have to do the same with Utley. Pat Gillick said Utley was feeling some pain in his hip back in late July. Utley quickly brushed it off. We’ve seen Utley come up a little slow or lame on a few plays, but nothing harrowing. Really, Utley could be feeling the aches of August, but enough to consistently keep him below the .290 mark? A few questions are up to play. Is Utley hurt? How much? 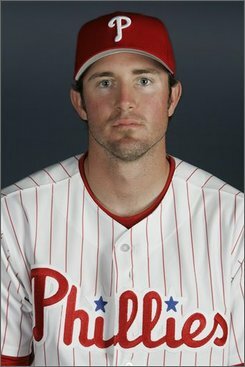 And would an Utley hitting .280 at 50-60 percent be better in the short-term than an Eric Bruntlett or Brad Harman? If Utley is hurt and denies it, are we risking a long-term problem after 2008? Really, if he his hurt, it might be better to stick with him until the year is over. Maybe it is just aches and bruises. We can only hope.